We’d love your help. Let us know what’s wrong with this preview of Vintage Munro by Alice Munro. In an unbroken procession of brilliant, revelatory short stories, Alice Munro has unfolded the wordless secrets that lie at the heart of all human experience. She has won three Governor General’s Literary Awards in her native Canada, as well as the National Book Critics Circle Award. 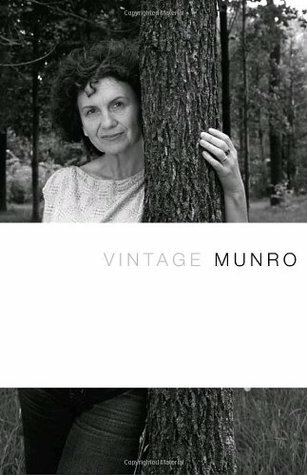 Vintage Munro includes stories from throughout her career: The title stories from her collections The Moons of Jupiter; The Progress of Love; Hateship, Friendship, Courtship, Loveship, Marriage; “Differently,” from Selected Stories, and “Carried Away,” from Open Secrets. To ask other readers questions about Vintage Munro, please sign up. Nobel Prize Winner Alice Munro is a shining example of why I absolutely love short stories. This collection is comprised of six critically-acclaimed stories including "The Moons of Jupiter," "Differently," and "Carried Away." Munro's keen perception and ability to write about the human experience is undeniable. Her prose is simple and the stories are quiet and reflective, alternating between past and present and spanning decades and focusing intently on relationships. Be forewarned that illness Nobel Prize Winner Alice Munro is a shining example of why I absolutely love short stories. This collection is comprised of six critically-acclaimed stories including "The Moons of Jupiter," "Differently," and "Carried Away." Munro's keen perception and ability to write about the human experience is undeniable. Her prose is simple and the stories are quiet and reflective, alternating between past and present and spanning decades and focusing intently on relationships. Be forewarned that illness and death are recurring themes. Finally unpacked this and finished it. All I want from short stories are reflective, lyrical and inventive language, characters I care about and a sense that the author-god behind it is intuitive about her characters' inner lives. Alice Munro is the Karl Malone of short story writers: she delivers. That is the cheesiest sports analogy I've ever attempted. I loved Munro's lovely descriptions of ordinary things, like trying on clothes: "The fit was all right--the skirt shorter than what she was used to, but then what she was used to was not the style. There was no problem with the suit. The problem was with what stuck out of it. Her neck and her face and her hair and her big hands and thick legs" (from "Hateship, Friendship, Courtship, Loveship, Marriage"). Her works are like puzzles. They end ambiguously, and you find yourself turning to the beginn I loved Munro's lovely descriptions of ordinary things, like trying on clothes: "The fit was all right--the skirt shorter than what she was used to, but then what she was used to was not the style. There was no problem with the suit. The problem was with what stuck out of it. Her neck and her face and her hair and her big hands and thick legs" (from "Hateship, Friendship, Courtship, Loveship, Marriage"). Her works are like puzzles. They end ambiguously, and you find yourself turning to the beginning to figure out how the title applies to the story. I went a little crazy after reading "Carried Away" when a character appears in the story 30 years after he was decapitated. How did that happen? What did that mean? I turned to Google to discover the symbolism. Munro is a thinker like that. "If you read a lot of Alice Munro's works carefully, sooner or later, in one of her short stories, you will come face to face with yourself," said Professor Peter Englund in the Nobel Prize Award Ceremony. "This is an encounter that always leaves you shaken and often changed, but never crushed." I found that line in "Differently," a story of a woman who finds a lover, then finds herself: "Trouble began, perhaps, as soon as they said that they loved each other." Like a short story writer who earns Noble Prizes, Munro writes of small things and big things: health care decisions and death, letters and love, errands and endings. She is worth picking up. A veces el cuento es despreciado un poco como forma literaria. Un cierto sector del mundo de la literatura, pareciera seguir terco en creer que de trata tan solo de un divertimento intrascendental, sin la misma relevancia de una novela, por ejemplo. Sin embargo, a lo largo de la historia, excelentes cuentistas han dado muestras de que esto no es más que una falacia, nombres como el de Kafka, Poe, Chejov o Quiroga dan buena muestra de esto. Ante esto, lo único que podemos afirmar es que el cuento A veces el cuento es despreciado un poco como forma literaria. Un cierto sector del mundo de la literatura, pareciera seguir terco en creer que de trata tan solo de un divertimento intrascendental, sin la misma relevancia de una novela, por ejemplo. Sin embargo, a lo largo de la historia, excelentes cuentistas han dado muestras de que esto no es más que una falacia, nombres como el de Kafka, Poe, Chejov o Quiroga dan buena muestra de esto. Ante esto, lo único que podemos afirmar es que el cuento no es para todo el mundo, y que no todos los escritores están listos para él. Alice Munro es con certeza, una cuentista de un nivel excelente. Su dominio de la técnica les confiere una cadencia que hace que desde el inicio seas capaz de adaptarte a cualquiera que sea la historia que te esta contando. Y hablando del contenido de las mismas, encontramos un excelente reflejo de la condición humana, en particular de la mujer. No se puede decir que sus relatos sean feministas, pero son acerca de mujeres, de todas las condiciones posibles, y en ellos se nos revela un mundo cargada de infinitas posibilidades y matices, así como anhelos y frustraciones, como en la vida misma. Esta pequeña selección da una buena idea del trabajo general de Munro, y es un gran ejemplo de lo que un buen cuentista puede hacer. Además de el fondo de las historias que nos presenta, la forma en que lo hace es muy relevante y muy merecedora de ser estudiada por si misma. Es una muetra de un talento que a veces evoca a los grandes cuentistas rusos, como el ya mencionado Chejov, claro, adaptado a las condiciones y realidad de Munro. Several friends and acquaintances recommended Alice Munro. So I read her out of curiosity, to learn why these stories had won such fervent support. I think that Munro writes about daughter-protagonists who are not entirely comfortable being adults, and whose parents have grown old. The tension in these stories arises from the question, is anyone in charge? The parents are not in charge because they lose their authority and competence as they age. One would expect a succession to the younger gener Several friends and acquaintances recommended Alice Munro. So I read her out of curiosity, to learn why these stories had won such fervent support. I think that Munro writes about daughter-protagonists who are not entirely comfortable being adults, and whose parents have grown old. The tension in these stories arises from the question, is anyone in charge? The parents are not in charge because they lose their authority and competence as they age. One would expect a succession to the younger generation, but the daughter-protagonist is not ready to be in charge. All the characters seem to know that something is wrong, but they are in denial and don’t speak openly about it. Years ago some of my co-workers were reading a book of Alice Munro's short stories entitled "The Moons of Jupiter." I didn't join them however I always kept this author in the back of my mind as someone to read (I normally don't read short stories and prefer novels). This past summer (2013) I decided to try some short stories and looked for Ms. Munro's books in a local public library. I decided to try this "vintage" collection as it features stories from a number of her books of short stories. I Years ago some of my co-workers were reading a book of Alice Munro's short stories entitled "The Moons of Jupiter." I didn't join them however I always kept this author in the back of my mind as someone to read (I normally don't read short stories and prefer novels). Unfortunately, this collection of short stories was the case of expectations killing joy. I would normally wait for a Nobel prize winner to grab all of my attention, make me crave for every word to follow and let me enjoy every twist and turn with awe. Alice Munro’s stories are well-fetched, offer a deep investigation of characters’ psychology, impress with a careful choice of wordings. Yet the stories are too refined, careful, and restricted. They seem to be written by a straight A student tryi Unfortunately, this collection of short stories was the case of expectations killing joy. I would normally wait for a Nobel prize winner to grab all of my attention, make me crave for every word to follow and let me enjoy every twist and turn with awe. Alice Munro’s stories are well-fetched, offer a deep investigation of characters’ psychology, impress with a careful choice of wordings. Yet the stories are too refined, careful, and restricted. They seem to be written by a straight A student trying to please the teacher. Moreover, I had extreme difficulties feeling the writer herself. It’s as if the stories are written absently – with no traces of writer’s involvement. The only trace that gives away Alice Munro’s touch is her impeccable style. Vintage Munro is quite simply a beautiful book. I came across Alice Munro some years ago in a volume of Best American Short Stories and flagged her work for further exploration, enchanted by the clarity, intimacy and tenderness of her character portrayals. Since then, having explored an odd story now and again, I had arrived at the general impression of a flawed writer—one who approaches greatness but often falls just short, with a long string of also-rans. The stories I had read had wonderful mo Vintage Munro is quite simply a beautiful book. I came across Alice Munro some years ago in a volume of Best American Short Stories and flagged her work for further exploration, enchanted by the clarity, intimacy and tenderness of her character portrayals. Since then, having explored an odd story now and again, I had arrived at the general impression of a flawed writer—one who approaches greatness but often falls just short, with a long string of also-rans. The stories I had read had wonderful moments, but somehow just slightly missed the mark, not entirely holding together and making their points with the clarity I had wished for. I am extremely pleased and indeed humbled to say that this is not the case in this volume. Vintage Munro is not all perfection, in my opinion. Of the six stories contained in this volume, I feel that two of them fit my previous impression of a writer whose work doesn't quite attain the heights it ambitiously attempts to scale. The other four, however, are majestic and transporting. This is far better odds than I am used to in short story collections, where one is often tickled and pleased to come face to face with even one or two gems. Here, we have four rich, magnificent tales, and two that are thought-provoking and engrossing but somewhat flawed. Nevertheless, in sum, this is a fantastic effort, a book I would not hesitate to broadly recommend. Alice Mundro is the winner of the Nobel Prize in Literature 2013. “She is a virtuoso of the elliptical... the master of the contemporary short story...” (From the Presentation Speech, Nobel Prize in Literature 2013). Vintage Munro has 209 pages divided into 6 short stories including The Moons of Jupiter; The Progress of Love; Hateship, Friendship, Courtship, Loveship, Marriage; Differently; Carried Away; In Sight of the Lake. The book is published by Vintage International with themes centered at Alice Mundro is the winner of the Nobel Prize in Literature 2013. “She is a virtuoso of the elliptical... the master of the contemporary short story...” (From the Presentation Speech, Nobel Prize in Literature 2013). Vintage Munro has 209 pages divided into 6 short stories including The Moons of Jupiter; The Progress of Love; Hateship, Friendship, Courtship, Loveship, Marriage; Differently; Carried Away; In Sight of the Lake. The book is published by Vintage International with themes centered at human relationship. The most memorable story is Hateship, Friendship, Courtship, Loveship, Marriage as it builds the story slowly and unfolds the interconnectivity between events and characters. Despite the revelation about the relationship between father and daughter, I still don't quite understand the meaning of “the moons of jupiter” in the first novel. Vintage Munro is a great book compared to Munro's other books. Munro has the ability to bring storytelling beyond telling stories. She intricately design the plot to be flowing, realistic, never redundant, with drama related to the storyline. Compared to other Modern Literature, such as Kazuo Ishiguro's “Nocturne”, Munro writes with more compassion and feminine perspective. Those with interests in human life, literature, and novella should read Vintage Munro. These stories would be like a 2.5 that became a 3.This is the second Munro short story collection book I have read . All her stories seemed to me adhere to the same formula . Of a period of time of world war one or two,a melancholic , a depressive mischief .Even if the characters changed ,the place names changed I found any one character would feel at home in any of the stories . This was my second trial to find her genius, a difference that makes her stand out from others and I could not find it These stories would be like a 2.5 that became a 3.This is the second Munro short story collection book I have read . This was my first foray into Alice Munro's work. I struggled with her style of writing, and found the prose elliptical and sparse. I had to read each story at least twice to make sure I was understanding the plot correctly (and often, not much happens in the plot). I get that not-much-happening is kind of the point with Munro, but many of the stories felt too enigmatic (or too subtle?) for me to appreciate. Also, white people. That's not to say I wasn't moved. On Munro's work, Garan Holcombe note This was my first foray into Alice Munro's work. I struggled with her style of writing, and found the prose elliptical and sparse. I had to read each story at least twice to make sure I was understanding the plot correctly (and often, not much happens in the plot). I get that not-much-happening is kind of the point with Munro, but many of the stories felt too enigmatic (or too subtle?) for me to appreciate. Also, white people. That's not to say I wasn't moved. On Munro's work, Garan Holcombe notes: "All is based on the epiphanic moment, the sudden enlightenment, the concise, subtle, revelatory detail." This is true. When I experienced that moment of sudden enlightenment, it was delightful. Delicate but stirring, like a little pop followed by the sound of breaking glass. I adored the story Differently. "She thinks about sitting in the store in the evenings. The light in the street, the complicated reflections in the windows. The accidental clarity" (87). "His pallor, his dusty red hair [...], his quick, slouching, insolent, invading way of moving" (74). "By attention and avoidance, impersonal conversations in close proximity, by his oblivious prowling, and unsmiling, lengthy, gray-eyed looks, he soon had Georgia in a disturbed and not disagreeable state" (75). ""My car wouldn't start," she told the baby-sitter [...]. "I walked all the way home. It was lovely, walking. Lovely. I enjoyed it so much." Her hair was wild, her lips were swollen, her clothes were full of sand." "Raymond hugs her, then involves her in a long chilly kiss. He fastens onto her with an appetite that is grievous but unconvincing. A parody of passion, whose intention neither one of them, surely, will try to figure out "(87).
" "Squeamish," he said, in that same artificially and hatefully tender voice, as if he were licking fanatically at something loathsome." The cover story is peak Munro— a novel’s worth of detail packed into much fewer pages. This story, like Free Radicals, will stick with me for a long time. This collection of stories was a Christmas present from my Secret Santa, and I just got around to reading them on vacation two weeks ago. I was hoping I'd get an earlier collection I didn't own when I filled out my Secret Santa information memo. But Viintage Munro was perfect because it includes two of my favorite Munro stories, and three others that I don't remember reading, but are great examples of her work. Relationships are always the central theme of her stories, and in these pieces, one d This collection of stories was a Christmas present from my Secret Santa, and I just got around to reading them on vacation two weeks ago. I was hoping I'd get an earlier collection I didn't own when I filled out my Secret Santa information memo. But Viintage Munro was perfect because it includes two of my favorite Munro stories, and three others that I don't remember reading, but are great examples of her work. Relationships are always the central theme of her stories, and in these pieces, one daughter dotes over an ailing father, while another burns the bills of a $3000 inheritance in the wood stove; a young wife ends an affair, and a close friendship all in one night; a widow's story of one of the most curious forms of unrequited love ever devised eventually leads to a fulfilling, fateful marriage; a hard, and hard-working housekeeper gets fooled into thinking her employer's son-in-law is in love with her. For readers new to Munro, a Canadian, these stories truly are "vintage." Her characters often strip themselves bare in letters to utter strangers; they travel by train or bus and have odd, mystical encounters in stations or while in motion. Included in this collection, as in all I can remember, is the ubiquitous librarian, and a woman writer. And nearly every story zeroes in on the misunderstood intentions of misunderstood characters. Of course, Munro carefully describes women's outfits -- as a man I undertand I'm in a tiny minority of her readers, and I get that Alice loves writing about women's clothes, (sequins and tulle, and a peach-colored rayon nightgown trimmed with ecru lace, a satiny ivory dress with red dots, and a red-lined frill over the hips, and red high-heeled shoes -- those just from the first two stories) but I have to say that I'm rolling my eyes during these parts of her stories. The detail is fine, it's just borderline obsessive in my opinion. More interesting to me are the the unattractive but capable women who care for someone deathly ill and are rewarded in unusual ways. Every collection seems to include at least one violent death. Lovers of gore won't be disappointed here. And if you're a dork like me and into mechanics, pay careful attention to Munro's tense shifts -- changing from past to present tense when the mood calls for it. I'd chide my students for doing it. Munro, no slave to time, does it at tense moments in stories, forcing me to think about "tense" shifts in another light. And that's Alice Munro. Somehow she's able to condense material that it takes other writers 350 pages to develop into 40 or 50 pages. If you've never really considered short stories an art form, give Munro a chance. And this short collection will lead you to other stories my Munro, and then perhaps Flannery O'Connor, Raymond Carver, Anthony Doerr, Updike. I love a good novel, but I can read a dozen short stories in the same amount of time, and in the hands of writers like these, and especially Munro, it feels like I've covered so much more ground. This review has been hidden because it contains spoilers. To view it, click here. Stories about constrained lives in small town settings. Reading it made me feel nostalgic for a time I never knew and will never know, which I think speaks to Munro's talent of transporting us to new and wonderful worlds. The stories that struck a chord in me are "Carried Away" and "In Sight of the Lake". After reading "Carried Away", I was actually kind of terrified. Though terrified isn't the right word at all. Dread, perhaps, is better. The story inspired in me a feeling of cold dread that muc Stories about constrained lives in small town settings. Reading it made me feel nostalgic for a time I never knew and will never know, which I think speaks to Munro's talent of transporting us to new and wonderful worlds. The stories that struck a chord in me are "Carried Away" and "In Sight of the Lake". Vintage (named after the publisher, no doubt) is a collection of 6 Alice Munroe short stories, put together in honour of Munroe's winning of the 2013 Nobel Prize in Literature. As others have said far better than I could, Munroe is a talented author, and can make a lot (largely mental) happen in a short space. On the down side, I found the stories to be a little too "lady-centric" for my tastes. Not only are the main characters always women (which I don't have a problem with), the stories primaril Vintage (named after the publisher, no doubt) is a collection of 6 Alice Munroe short stories, put together in honour of Munroe's winning of the 2013 Nobel Prize in Literature. On the down side, I found the stories to be a little too "lady-centric" for my tastes. Not only are the main characters always women (which I don't have a problem with), the stories primarily have to do with relationships, often failed marriages and the reasons for, and aftermaths of, their failure. This collection of short stories was chosen for my book club. I wasn't really looking forward to it as I'm not a lover of short stories, but I was definitely entrigued by this Nobel prize winning collection. The stories take every day normal emotions and occurrences and escalate them to something beautiful and heart rendering to read. As with most short stories, however, I found that no matter how much I enjoyed reading them, the story ended just when I was getting into the plot. Also, I'm writin This collection of short stories was chosen for my book club. I wasn't really looking forward to it as I'm not a lover of short stories, but I was definitely entrigued by this Nobel prize winning collection. The stories take every day normal emotions and occurrences and escalate them to something beautiful and heart rendering to read. As with most short stories, however, I found that no matter how much I enjoyed reading them, the story ended just when I was getting into the plot. Also, I'm writing this review less than a week after reading this, and I can barely remember any of the content! I do have a rubbish memory, but this surpasses even my fickle brain. My favorite of her shorts so far is Differently - the story of Georgia, Maya, Raymond, Ben, Harvey, Miles, Hilda, Anne and Laura. Could anyone ever possibly make such permanent long term plans for their lives, one that they could keep no matter the change in circumstance... how could they? How is it done so confidently so often? Have you ever faked something to others in cahoots with your partner, friend?